Here it is. Finally. 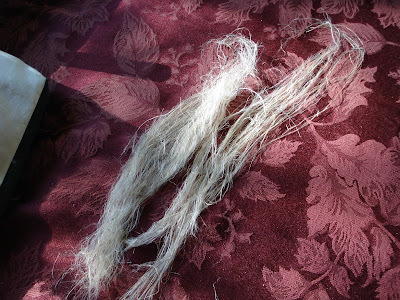 A 5m mini-skein of linen from my very own flax field. This is not what the whole field will produce! There’s much more to come, but I was anxious to see what it was like, so I finished up a couple of stricks and spun the fibre. In so doing I learned a few things. 1. Flax needs to ret until you can see the linen being released from the straw. In the murky retting water it looks like angel hair. Keep moving the water around to help with the release of the linen. 2. Flax has to be very dry for the next stages. So full-on sunshine for several days and a cover at night to protect from the dew is essential. The sunshine also helps to bleach the linen a bit. 3. 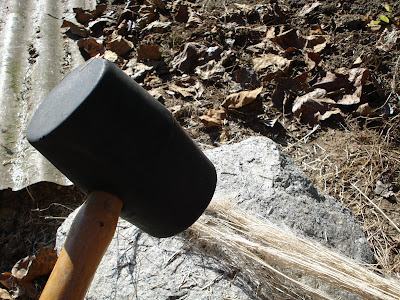 Pounding the flax with a rubber mallet against a flat rock further helps to release the linen from the straw. It’s a good workout for your upper arms. This stage is called Breaking. 4. The more you bash it against the rock, the more you will see the linen. When most of the straw is flat, that’s when you can start the next stage: Scutching. That’s where you break the straw into smallish bits so it will fall away from the linen. There are tools that help to do this, but I just broke it with my hands. 5. 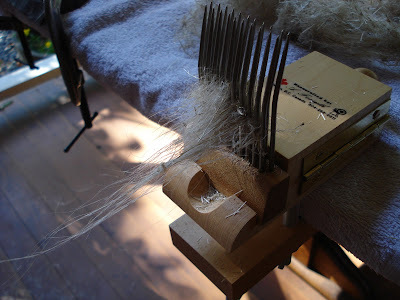 Wool combs are not the best tools to help remove the straw from the linen which is the next stage: Hackling. I got the best result from my cotton hand cards — not used in a hand-carding technique. I laid the carder flat and ran the straw-laced linen strick through it a few times, hanging on good and tight. Here’s what I got from bashing and combing a couple of stricks of flax. 6. The most important thing I learned is that despite my new found skills at growing, harvesting and producing linen for spinning, I DON’T REALLY KNOW HOW TO SPIN THE DARNED STUFF. It never occurred to me to research how to spin linen. I had a vague recollection from past reading that linen is wet-spun to keep the fibres aligned — I did that. It was only after I made a mini-skein from an over-twisted double-ply spinning technique and produced the most uninspiring hard yarn I have ever worked with did I think to check some expert sources (the internet) to see what I had done wrong. Thank heavens the disaster was in my spinning technique because I was ready to put the rest of the unprocessed flax onto the compost heap! All is not lost, I just have a whole new skill to master. Spinning flax. And you thought this adventure was nearly over. It’s only just begun. This entry was posted in flax, linen, spinning on October 12, 2012 by DianaTwiss. 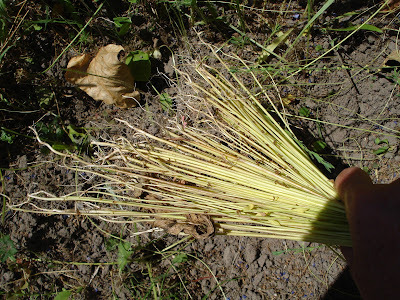 On the weekend I pulled the test flax out of the retting water. This was the small batch that I put in there because I had a hunch that it hadn’t retted enough. It’s hard to know exactly when it’s ready for the next stage, so test bundles are a good way to go. I am not usually this cautious about things, but one of the sources I read about retting gave a stern warning about the process. It stated that wet retting happens really fast (compared to the three to five months for dew retting, I guess anything less is fast) and if you leave it too long it will weaken your linen fibres. After all this work, I am not willing to let that happen. 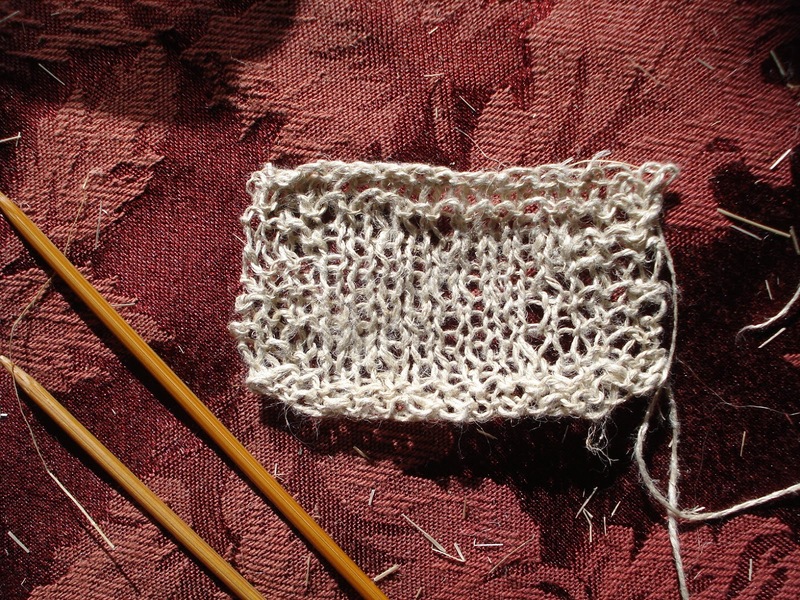 So I did a wee test with a small bundles of fibre. 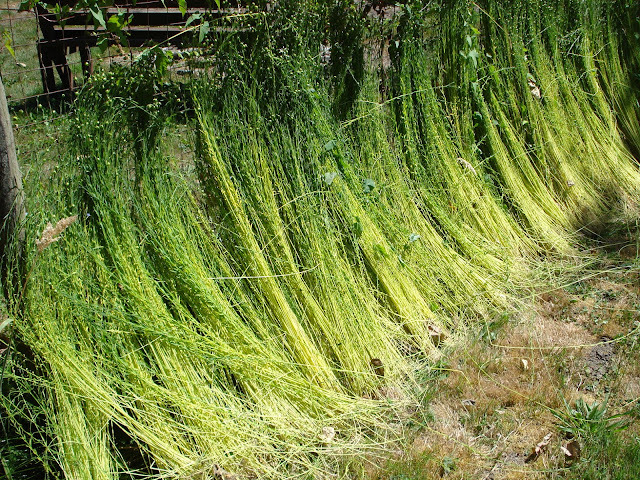 Last Saturday was a hot and dry day and the twice retted flax dried quickly. By the end of the day I couldn’t resist playing with it. I scrunched it up a bit and the brittle straw fibres broke and fell out, for the most part letting go of the linen in the process. I was so encouraged by this that after a short while I ended up pushing a wee bundle of the sample stuff through the next few stages. Here’s the result. It’s not exactly spin-ready, but it’s darned close. 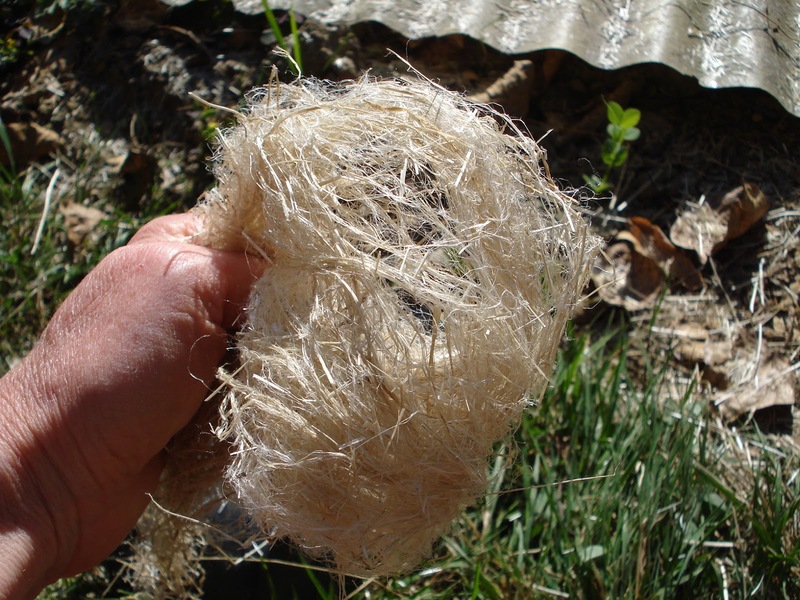 These two photos show the long fibres, you can see bits of the straw still embedded in there. 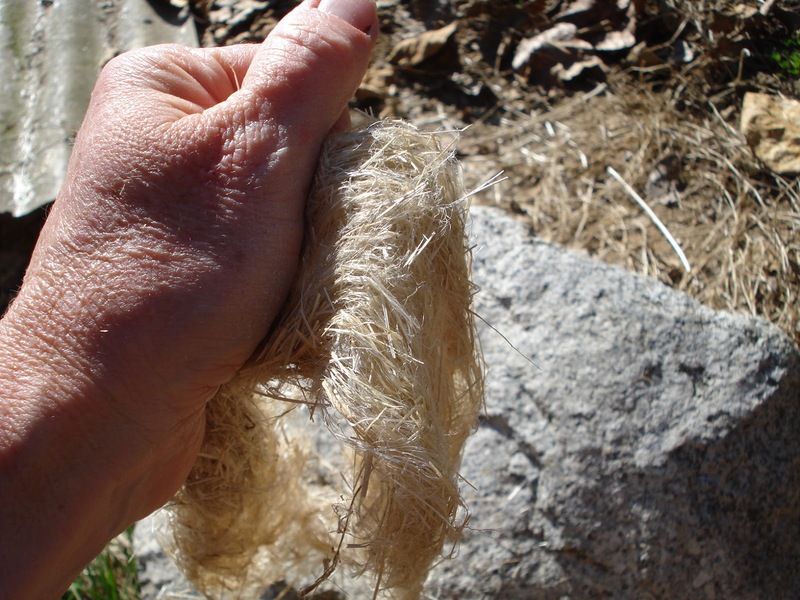 This linen is fibres from the entire length of the plant. 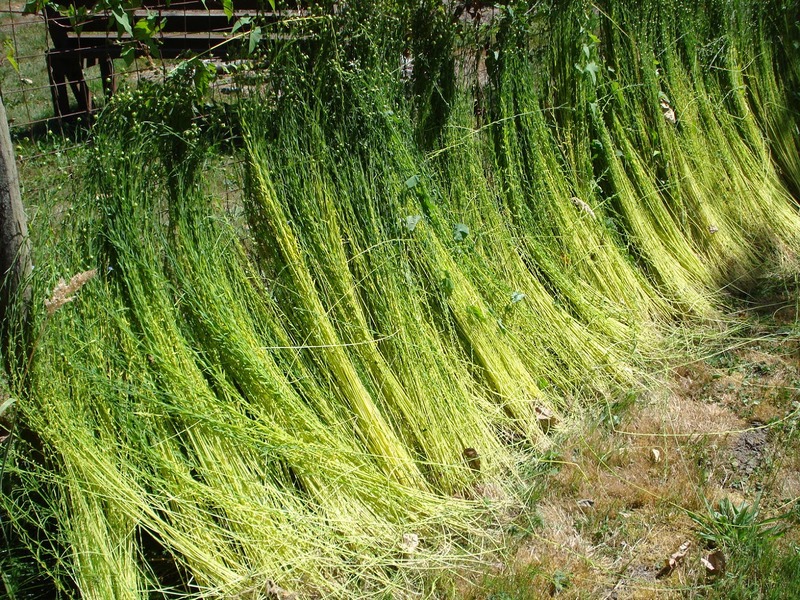 As far as I can understand the flax/linen industry, this is Prime. This next photo is the long fibres on the top and below are the shorter fibres I pulled from the comb. They are finer and shorter, about 4 inches on average, with less straw in them. I can’t imagine that they are less than Prime, but it seems to be graded according to length. We’ll see about that. Below is the waste linen that was left over after combing the linen. I tried to clean out the debris by hand carding it, and got a great deal of it out, but it still full of straw and other random bits. After all this work I just couldn’t throw this away. I am sure it will have a use. 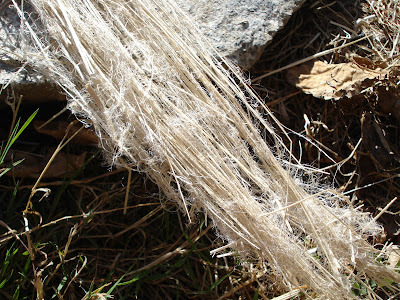 Paper, noily bits in a wool batt. Who knows? I am just so excited because it worked. I still have a lot of work to do — I can barely stand to think about it. But this journey of discovery has been so satisfying thus far. I don’t know how much fibre my wee field of flax will eventually yield, but it will be the most adored washcloth I have ever used. Ann, I will bring these samples with me to Kamloops and show you first hand what I’ve done. 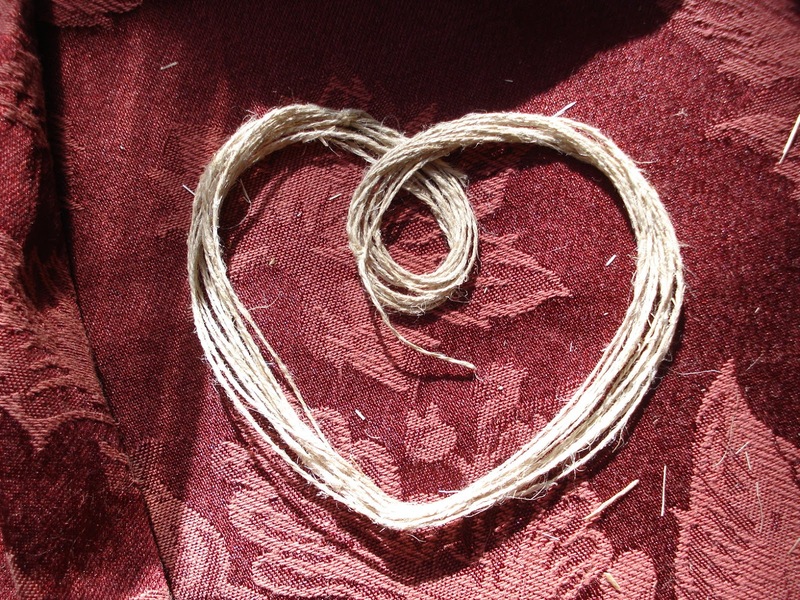 This entry was posted in flax, linen on October 5, 2012 by DianaTwiss. The flax had been sitting in bins full of water since last weekend. We’ve had unseasonably warm weather, so the water got quite warm through the day. It cooled down at night, but even so, the flax spent a great deal of time in warm standing water. I tried to replicate the action of a side eddy, by stirring it up a couple of times a day. I also removed some water and added new (rain) water every other day. Here’s what it looked like. There was definitely bacterial action of some kind as there was generally a foam on it, and near the end of the retting process, was a scum. It smelled awful — compared to some of the stuff, ie. crap they put on the hay field behind us, this wasn’t that bad. But it certainly wasn’t something you wanted to spend much time with. In the picture below, you can see it in the smaller bin. It’s murky and smelly. Using my bare hand, I moved the fibres around the water. My arm then smelled like hell. I suppose I could have used a stick, but I wanted to touch the fibres to see what they felt like as they were going through this process. They were flexible and firm, and a wee bit slimy. Below is the smaller bin with the retting water drained. It just looks like stalks of straw. Where’s the linen? Once I replaced the murky retting water with fresh water I noticed something I hadn’t before. See those fine fibres moving away from the stalk? That’s linen! In a flurry of excitement I finally understood how linen comes to be. Linen is the fine bast fibres that run between two major parts of the flax plant. The soft outer core (that I just got rid of through the retting process) and the harder inner core, the stalk of straw that holds it upright. I checked the flax in the other two larger bins, and yes, the same thing was taking place. The outer core had rotted or retted away and the linen was released. It is still somewhat attached to the inner core. That’s what the next couple of stages are all about. So I removed the flax from the water, wrung it out, and yes, when I wrung it out it smelled like a linen shirt. Well, not exactly, but now I understand where the distinct smell that linen has comes from. Fortunately I had replaced the retting water with new stuff before I made the decision that it had retted enough. I set it against the fence to dry. Here’s what it looks like today. It’s a lovely colour — flaxen gold. It’s not quite dry enough for the next stage, but I can now see the linen. When I rough up the tips and shake the straw out of it, what is left are soft, fine fibres of linen. I still have a long way to go before I have fibre to spin. But for the first time I can see it. I get it!! 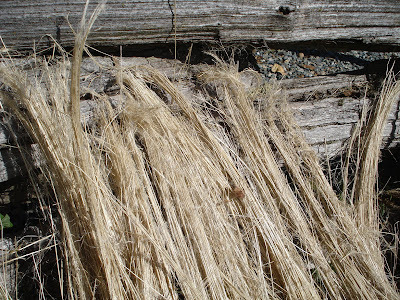 This entry was posted in flax, linen on September 16, 2012 by DianaTwiss. It’s coming on the end of the season and here’s what surprised me in the garden the last few days. Lovely in the midst of weeds and dry stuff. 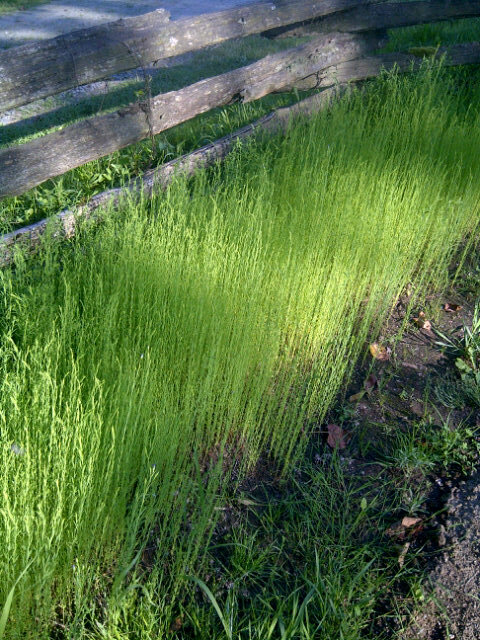 It is time to harvest the flax. I have been growing this stuff since June. With the exception of the flood, it has been a great growing season. 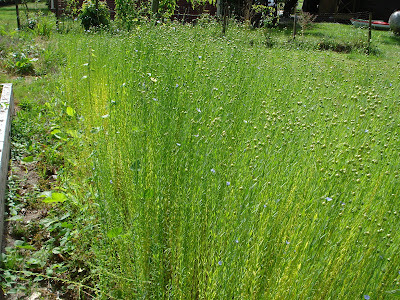 The flax came up good and straight, and blossomed all at the same time. It was a thing of beauty in its heyday. But now, it is time to harvest it. The flowers are mostly gone, over half the plant has turned yellow, and we are coning into a dry spell with full on sunshine. Good weather for drying it out. Here`s what it looked like right before harvest. It is easy enough stuff to pull. The roots, while they run deep, are not very thick. So to harvest I`d grab a handful and pull. 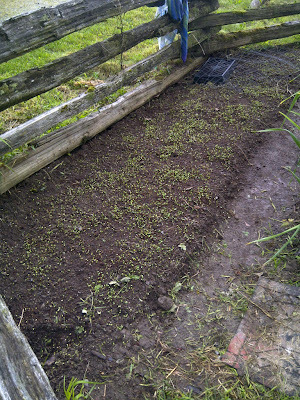 I`d do that until I had a good sized clump and then it went into the wheel barrow. The harvest in progress. No knowing how much fibre I will get from this activity, I tried to harvest every single plant. And believe me, it wasn`t easy to do. I did try to keep the area weed-free, but we are plagued by bindweed out here. It is also known as morning glory, but there is nothing of morning nor glory about it. It is hateful stuff that grows several feet a day and tangles anything that is vertical. So here`s when I made a bonehead decision. I jumped right to `retting` process. I decided I didn`t care to harvest the seeds so thought I could just start soaking them in water to melt the pectin and release the fibres. After some more reading and thought I decided that seed collection or not, the seeds and pods were a considerable amount of biomass. I did not need them in the way, rotting and adding to the smelly mess that retting involves. So I took them out of the soaking water, and put them along the grass, in a sunny location. I turned them every couple of hours to dry them off. At least they are clean and the roots have no dirt in them. There has to be a bright side to every stupid decision. Please be warned that I really do not know what I am doing. 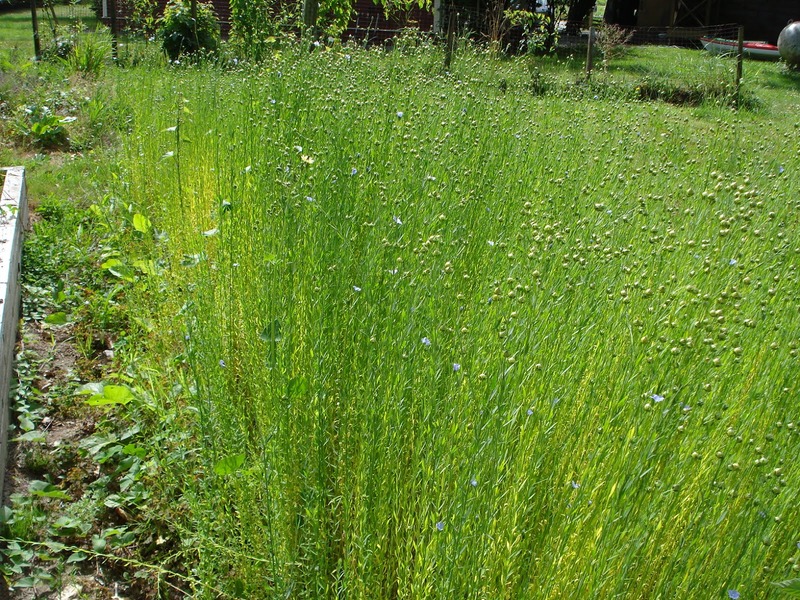 I know how to grow things, so I grew flax. I have a desire to be able to grow fibre for my use and so this is an adventure of self-discovery, aided by the Internet and various folks who know pieces of the process. Here it is drying. Later today — in fact right after this blog post, I`ll go to the back garden and stand these up for more efficient drying of the seed pods. 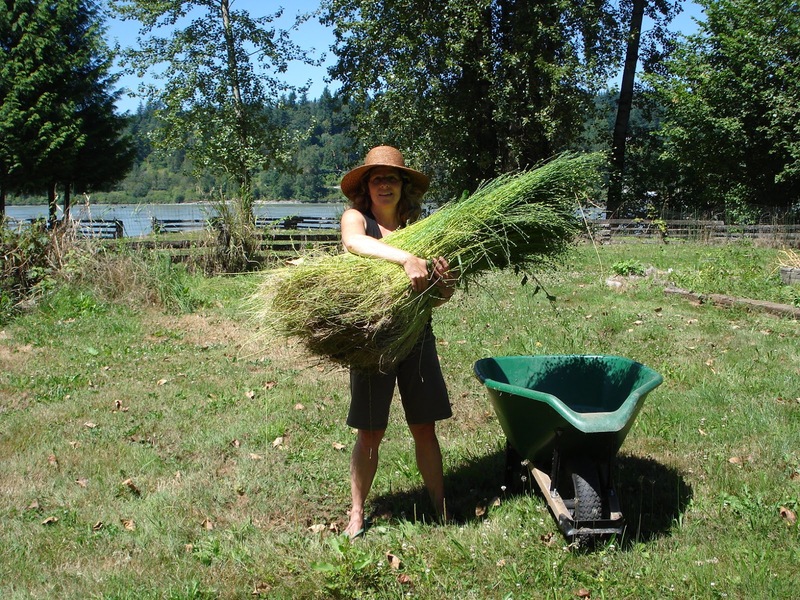 Stay tuned for more posts on the flax harvest. This entry was posted in flax, linen on September 3, 2012 by DianaTwiss.